Learn how to draw cartoon chickens with just a few simple shapes and lines. 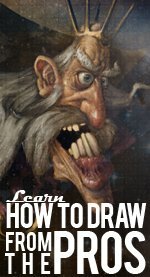 Grab your drawing gear and follow along! Make a circle for the head and below that give some space and then draw a large oval-for the body. Look at the example for the exact proportion and placement of the head and the body. Draw two slightly curved lines coming down from the side of the head circle. One line touches the body oval while the other line curves out. Join the two lines of the neck along the bottom with three "V" shapes like shown. Here in this step you'll draw two curves just below the neck on the front of the body to make the feathers under the neck of the chicken. Then on the other side of the body oval first add 2 slightly curved lines to make the back of the body. Use simple curves to add the tuft of tail feathers. Notice that the size of the curves gets smaller as you move from the top curve down towards the bottom one. Step 4 - Almost Done! Here you will erase all the extra lines from the face and the body of the chicken so that it comes in clear focus. It doesn't matter if you are drawing cartoon chickens or anything else - you need to remember to erase your guide lines from time to time as your drawing progresses. First you'll work on the beak of the chicken and make a curving triangle with a smaller triangle below it and the beak is done. Now, make a small circle to make the eyes and then draw an oval just below it to take care of the cheeks. At the top of the head draw another group of curves grouped together to make the chicken's crown and that's the last step to finishing the head of your cartoon chicken. Don't forget to add in the feet at the bottom of the chicken's body. The shapes are really simple - just follow the example drawing and you're almost finished with learning how to draw cartoon chickens. For this last step you will draw the wings in the middle of the chicken's body. How you will do it is to make a tilted "C" and then joining that a shape that kind of looks like a "3" with one extra curve on the bottom of it. As an optional last step you can add in the grass just below the feet of the chicken to complete your drawing.